The militant group reportedly carried out attacks starting January 3 on the northern town of Baga and neighboring villages, razing more than a dozen communities and forcing residents to flee for their lives. Some of those who attempted to flee eastward drowned in Lake Chad in their attempts to seek refuge; others remain stranded on an island facing lack of shelter, the threat of hippos and malaria. Over 7,000 others have fled to Chad since the beginning of the month, part of an exodus of tens of thousands as a result of the conflict, the UN refugee agency says. Human rights organization Amnesty International has said that the Baga area attacks may be the deadliest Boko Haram has carried out. “The attack on Baga and surrounding towns, looks as if it could be Boko Haram’s deadliest act in a catalogue of increasingly heinous attacks carried out by the group. If reports that the town was largely razed to the ground and that hundreds or even as many as two thousand civilians were killed are true, this marks a disturbing and bloody escalation of Boko Haram’s ongoing onslaught against the civilian population,” Daniel Eyre, Nigeria researcher for Amnesty International, said in a statement issued Friday. Deadly attacks continued this weekend. 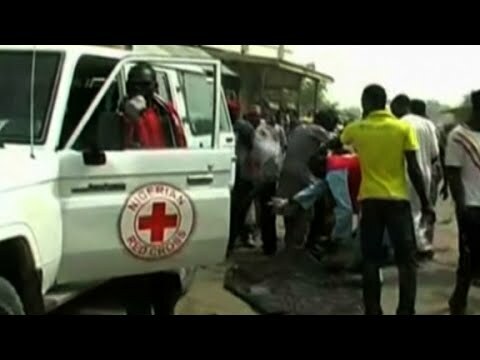 Up to 20 people were killed when explosives strapped to a girl believed to be 10-years-old went off Saturday at a market in Maiduguri. A similar incident involving two young girls strapped with explosives took place Sunday in the town of Potiskum, killing three people. Boko Haram is suspected of being behind the attacks. Though the number feared dead in this latest series of attacks, even the lower estimates, dwarfs the number killed in the recent terror attacks in Paris, the attacks in Nigeria have failed to garner the same kind of media attention, some have noted.